Chef Maycoll Calderón (Mexico City’s Huset) has debuted Tintorera, a seafood-centric, modern Mexican restaurant in Silver Lake. Décor includes an outdoor oasis surrounded by greenery and illuminated by strung lights and pendant lanterns, with bright blue cement tiles and rustic wood tables and chairs. Calderón brings his signature “cocina de campo” (country kitchen) style of Mexican cooking from Huset to Los Angeles, with a refined menu that emphasizes crudo and raw plates alongside roasted fish and meat dishes. 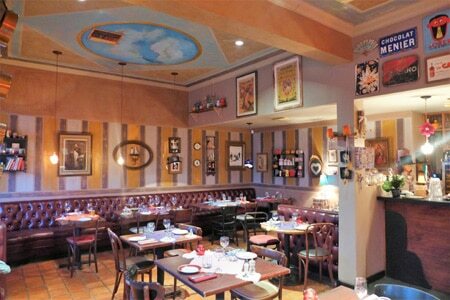 Tintorera, 2815 Sunset Blvd., Los Angeles, CA 90026, 323-741-0055. Summer may be winding down, but Springside has sprung. Restaurateur Yassmin Sarmadi and chef Tony Esnault have turned the bar area at their downtown L.A. restaurant Spring into this intimate, bistro-style setting for weeknight dinners (Tues.-Sat.) and happy hour (Tues.-Fri. 5 p.m.-7 p.m.). Springside, Douglas Building, 257 S. Spring St., Los Angeles, CA 90012, 213-372-5189. Restaurateur Paul Hibler (Superba Food + Bread, Pitfire Artisan Pizza) is behind Gesso, a casual restaurant with chef Doug Miriello at the helm. The all-day menu includes breakfast fare, jidori chicken nuggets and a cheeseburger topped with grilled onions and Thousand Island dressing, as well as several pizzas. 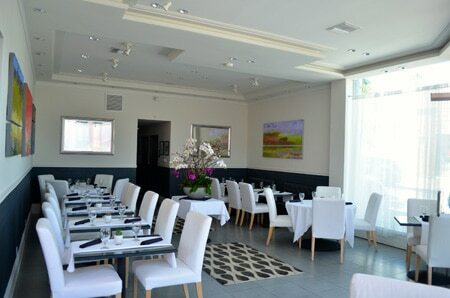 Gesso, 801 N. Fairfax Ave., West Hollywood, CA 90046, 323-544-6240. Xiang Yuan Gourmet offers new dim sum options in Temple City, with delightfully artful bao shaped like hedgehogs and mushrooms. Favorite standards such as spare ribs, barbecue pork buns, har gow and siu mai are joined by the more unusual pork blood jelly with chives and baked almond cream bun. Breakfast, Lunch & Dinner daily. Xiang Yuan Gourmet, 9556 Las Tunas Dr., Temple City, CA 91780, 626-286-6788. Green Zone’s organic Asian cuisine is now being served up in a sleek new location in Temple City. 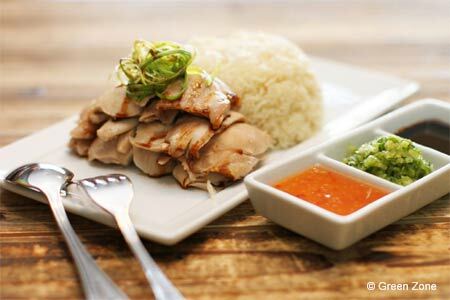 Look for the signature favorite of organic Hainan chicken rice, as well as grilled lemongrass pork chop, Thai basil shrimp with rice, wonton and dumpling soup, and turnip cake. The restaurant is open for lunch and dinner in its soft open phase, and will debut breakfast in the near future. Green Zone, 5728 Rosemead Blvd., Temple City, CA 91780, no phone. Koreatown’s gigantic Gaju Marketplace complex has debuted a cool, modern Korean food court called Square Mixx, offering branches of South Korea’s favorite food franchises. Included are Nipong Naepong (noodles), Brown Donkatsu (black pork fried katsu), Robot Kimbap (healthy kimbap rolls) and Cafe Bora (purple sweet potato bingsu, Korean shave ice). Look for more shops to open this fall. Lunch & Dinner daily. Square Mixx, Gaju Marketplace, 450 S. Western Ave., Los Angeles, CA 90020, no phone. , 633 W. 5th St., Ste. 400, Los Angeles, CA 90071, 323-500-1186. In Santa Monica, SUGARFISH co-founder Lele Massimini has opened Uovo on 2nd Street, serving up fresh traditional “sfogline” pastas shipped directly from Bologna, Italy. The pasta is made with special eggs found only in Italy. Look for tagliatelle ai carciofi, tonnarelli carbonara and ravioli di ricotta. To drink, there’s Italian beer and select wines. Lunch & Dinner daily. Uovo, 1320 2nd St., Ste. A, Santa Monica, CA 90401, 310-425-0064. Coming this fall to the Arts District is Simone, the highly anticipated restaurant from chef Jessica Largey (Manresa). Various spaces will include a six-seat chef’s counter for tasting menus, a rooftop garden and a butcher room. Former The NoMad sommelier Jordan Egan will be in charge of the wine list, and Scotsman Iain McPherson will run a bar program offering high-end craft cocktails. Simone, 449 S. Hewitt St., Los Angeles, CA 90013, no phone. Chef Nassir Nasr has launched the Mediterranean restaurant Marsa Lounge in West LA, featuring dishes from his native Tunisia as well as Morocco, Turkey, Lebanon and Greece. Look for falafel and other mezze, a braised lamb shank tagine, beef and salmon kebabs, grilled sea bass and a vegetarian plate. For dessert there’s rose blossom baklava. Lunch & Dinner daily. Marsa Lounge, 11906 Wilshire Blvd., Los Angeles, CA 90025, 310-310-2999. Merci Clement has opened in Beverly Hills on Santa Monica Boulevard, serving up breakfast and lunch. Look for baguette sandwiches, a smoked salmon salad, fruit parfaits, espresso drinks and pastries including a chocolate croissant and eclairs. There’s some sidewalk patio seating, too. Breakfast & Lunch daily. Merci Clement, 9887 S. Santa Monica Blvd., Beverly Hills, CA 90212, 323-770-2626. Burbank seafood lovers can now find their favorite Cajun boil at The Boiling Crab. Look for oysters, blue crab, king crab, crawfish and shrimp, boiled or fried, alongside gumbo, chowder, corn and Cajun fries. To drink there are teas, beer and margaritas. Lunch & Dinner daily. The Boiling Crab, 140 E. Palm Ave., Burbank, CA 91502, 747-201-3346. Making the jump from NYC, chef/restaurateur April Bloomfield (The Spotted Pig, The Breslin Bar & Dining Room) and business partner Ken Friedman will open Hearth & Hound in the former The Cat & Fiddle location on Sunset Boulevard. Hearth & Hound, 6530 Sunset Blvd., Los Angeles, CA 90028, no phone. Fast-casual sushi spot Quick by Katsu-ya has popped up on Ventura Boulevard in Studio City. The eatery offers oysters, lobster ramen and a slew of budget-friendly open hand rolls ranging from spicy tuna to dynamite crawfish and seared garlic albacore. Look for six beers on tap, hot and cold saké, and house wine. Lunch & Dinner daily. Quick by Katsu-ya, 11928 Ventura Blvd., Studio City, CA 91604, 747-203-1192. In Beverly Hills, Tarte Tatin Bakery & Cafe has opened its second location, offering Mediterranean dishes with influences from Israel, Tunisia, Romania and France. Look for an array of baked goods and breakfast served all day featuring a Mediterranean meal and shakshuka, sandwiches like Tunisian tuna on baguette, salads, soups and a variety of coffee drinks. Breakfast & Lunch daily. Tarte Tatin Bakery & Cafe, 200 S. Beverly Dr., Beverly Hills, CA 90212, 424-777-0033. Chef Christer Larsson (Aquavit) is now dishing up Scandinavian cuisine with his son at Alta Nordic Kitchen on Melrose Avenue. Options include gravlax, potted beef cheeks and marrow, Greenland shrimp on toasted brioche, wood-grilled halibut, plank steak, Danish meatballs, and apple cake with rye crumble and vanilla ice cream. Expect beer and wine. Brunch hours will be added soon. Dinner nightly. 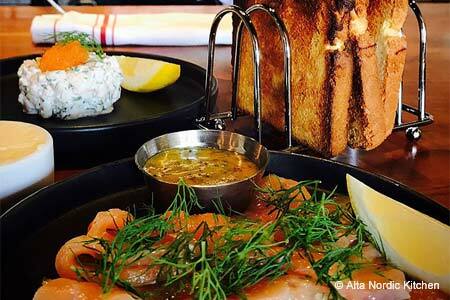 Alta Nordic Kitchen, 7274 Melrose Ave., Los Angeles, CA 90046, 323-746-5221. Chef Dakota Weiss has opened her sixth location of Sweetfin Poké in Silver Lake on Sunset Boulevard. Look for signature creations like the spicy yuzu salmon, mango albacore or Sriracha tuna bowls, or build your own with green bamboo rice, seasonal toppings and Weiss’ special sauces. To drink, find house-infused teas and coconut waters with flavors such as dragon fruit and lemongrass. Alcohol will be available soon. Lunch & Dinner daily. Sweetfin Poké, 3112 Sunset Blvd., Los Angeles, CA 90026, 323-300-6210. 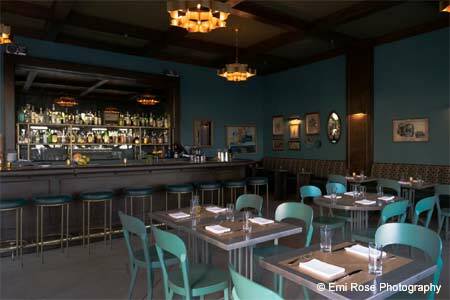 Matthew Kaner (Covell) has opened Good Measure, a new wine bar and restaurant in Atwater Village. Look for earth tones and wood, banquettes for dining, a lively bar and a wine room that hosts tastings. The dinner menu features the likes of oysters, charcuterie, lamb belly, a bone-in pork chop and sautéed scallops; brunch offers avocado toast, soft polenta with roasted mushrooms, eggs, and a brunch burger. Expect a knowledgeable collection of wines curated by Kaner. Good Measure, 3224 Glendale Blvd., Los Angeles, CA 90039, 323-426-9461. Umami Burger founder Adam Fleischman is setting out to reinvent the classic peanut butter and jelly sandwich at PBJ.LA at Grand Central Market in downtown LA. PBJ.LA, Grand Central Market, 317 S. Broadway, Los Angeles, CA 90013, no phone. 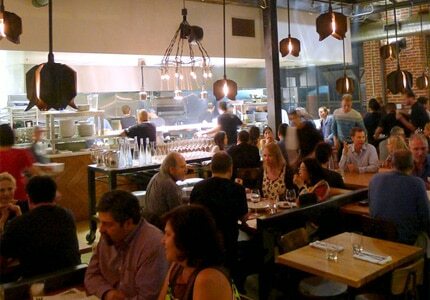 Bestia in the downtown L.A. Arts District is temporarily closed due to a kitchen fire. According to the restaurant's Facebook announcement, the Italian hotspot will try to re-open as soon as possible. Bestia, 2121 E. 7th Pl., Los Angeles, CA 90021, 213-514-5724. Maple at Descanso Gardens, already one of LA’s prettiest brunch spots, is now open for lunch Thursday and Friday from 11 a.m.-2 p.m. Look for seasonal salads, soups, sandwiches and other specialties, and a two-course lunch priced at $17. Maple, Descanso Gardens, 1418 Descanso Dr., La Cañada Flintridge, CA 91011, 818-949-4200. Westfield Century City has announced a slew of restaurants to open when the mall unveils its massive billion-dollar renovation this fall. Look for Biryani’s by Spice Affair, Grom, Kafe Bougatsa, Panini Café, Rori’s Artisanal Creamery, Randy’s Donuts and Wexler’s Deli to debut immediately. Newly revealed signings slated for future openings include Saint Marc, Tocaya Organica and Aloha Poke Co., as well as the yet unnamed restaurant to be launched by chef Jonathan Waxman. The new Westfield Century City was designed in collaboration with L.A. based designer Kelly Wearstler and will encompass more than 1.3 million square feet of space, double its parking capacity and eventually link to the LA Metro Purple Line subway. Westfield Century City, 10250 Santa Monica Blvd., Los Angeles, CA 90067, 310-277-3898. Chef Alexandre Ageneau has departed Petrossian Boutique & Restaurant in West Hollywood. The former sous-chef from Le Cirque at the Bellagio Las Vegas will soon take the helm. Petrossian Boutique & Restaurant, 321 N. Robertson Blvd., West Hollywood, CA 90048, 310-271-6300. Ayara Thai Cuisine is temporarily closed for renovations. In the meantime, check out the restaurant's Ayara Luk pop-up across the parking lot. Ayara Thai Cuisine, 6245 W. 87th St., Los Angeles, CA 90045, 310-410-8848. In Santa Monica, trendy eatery Areal has closed on Main Street. Areal, 2820 Main St., Santa Monica, CA 90405, no phone. In West Hollywood, the iconic Maison Richard has closed. After 32 years, the Maison Richard brand and company officially ended its operation on August 13, 2017. New owner chef Josette LeBlond will open an outpost of her Normandie Bakery at the WeHo location on September 1. Maison Richard, 707 N. Stanley Ave., Los Angeles, CA 90046, no phone. Blue Hen, a local favorite for Vietnamese fare in Eagle Rock, closed after service on August 25, 2017. Blue Hen, 1743 Colorado Blvd., Los Angeles, CA 90041, no phone. Corsican restaurant Napoleon & Josephine sadly closed its doors after service on September 17, 2017. A new chef has already purchased the location on Melrose Avenue. Napoleon & Josephine, 7212 Melrose Ave., Los Angeles, CA 90046, no phone.